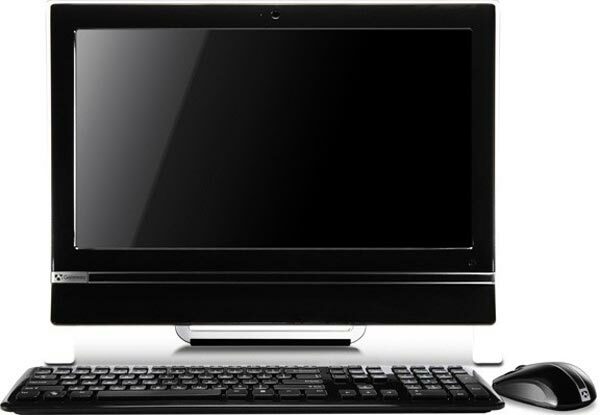 Gateway has launched a pair of new all in one desktop PCs, the Gateway One ZX6800, and the ZX4800. Both of these new all in one PCs will come with Windows 7, and feature a multi-touch LCD display, the ZX6810-01 will comes with a 23 inch multi-touch display with a resolution of 1,920 x 1080, an Intel Core 2 Quad Q8200s process, a 1GB ATI Radeon HD 4670 graphics card, and 8GB of DDR2 RAM. There is also a slot loading DVD burner, a 1TB hard drive, or a 64GB SSD, WiFi, Gigabit Ethernet, six USB 2.0 ports, eSata, and a wireless keyboard and mouse. The ZX4800-2 features a 20 inch LCD display with a resolution of 1,600 x 900, a 2.1 GHZ T4300 processor, and Intel GMA X4500HD integrated graphics, 4GB of DDR2 Ram and a 750GB hard drive. They will both go on sale later in the year, with the ZX6800 series retailing for $1,399 whilst the ZX4800 will retail for $749.